Here is how we work: In the convenience of your own home, we discuss your project and organizational goals. A typical consultation takes about thirty minutes. Then you schedule a working session with us at a time convenient for you (minimum of two hour increments). You participate in your project as much or as little as you want. If you want us to do most of the work, let us take over and we will consult you only for important decisions. Then sit back and relax. 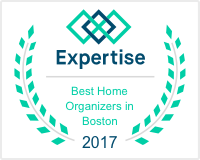 Or if you would like a cooperative venture, we work together and you come away with great ideas on how to organize your home or office.